Four of our women graduated (Kasey, Halee, Kelly, and Swanietra) from the Center of Hope’s Jobs for Life Class. Jobs for Life not only prepares them for obtaining a job, it also prepares them for different aspects of life. Thank you so much for pouring into our women! 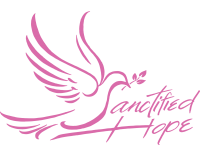 Sanctified Hope Home for Women is a Christ-centered transitional home for women who have just recently been released from prison. We provide a safe inviting place to live away from distractions. The women will be discipled in God’s word as they learn to rebuild their lives. We have done our research, and there are not many Christian-based transitional homes. And the ones that are out there are full to capacity. where we store extra donations given to us!